When I look at the calendar, I see that I have not posted anything here for a couple of weeks. Have to admit I've really been enjoying some time away from blogging. In fact, I really had to talk myself into sitting in front of the computer today. My body balks at sitting and my mind demands that I go outside and enjoy the beautiful weather. But here I am ... because my heart tells me I must maintain my connection with all you wonderful people. Right now, YOU are what I miss about blogging. I hope you are all well. First, let me say to Photo Art Resource Cache subscribers that the full subscription of textures is up and waiting for you to download. If some of you had trouble with the downloads recently, the problem has been fixed. The site will close on May 15th, so grab your textures while you can and enjoy! 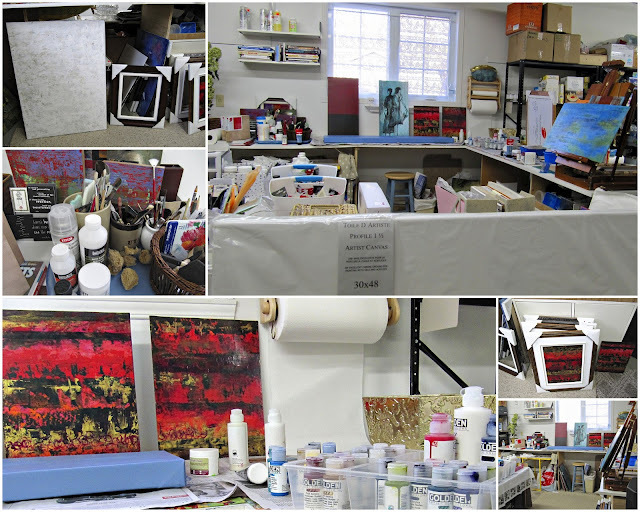 Here is where I play with paints, brushes and spatulas. I love texture (you already know that!) and find using spatulas (more than brushes) suits what I like to do (and am capable of doing). Not the best photograph, but it gives you a bit of an idea of what became of the canvas in the upper left of the previous collage ... I intended for the edges to look scuffed and textured. Really ... I did! This painting is really much brighter and more dynamic than this photo shows. Really ... it is! 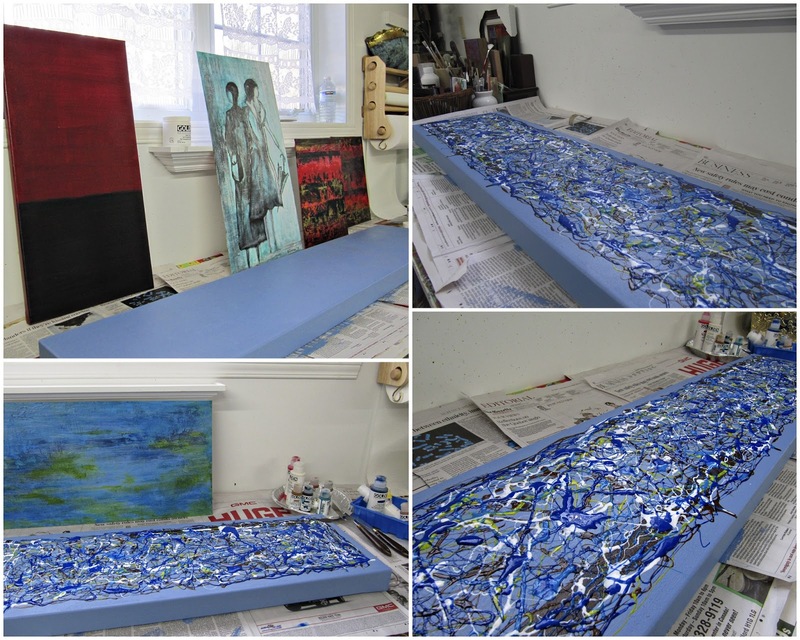 Canvases in various states of completion. The blue one is one requested by my son - 'wide, narrow and full of blues' were his words. Here's a clipped view of the finished Pollock-esque piece for my son. The black figure on a red background above is a study of a famous painting by Matisse and I am calling it, 'Etude Matisse'. The one with a similar figure to the left of it has been claimed by my middle daughter and her partner and is now set off in a great gold frame with white matte. Here is the painting for my middle daughter, sitting on a table in poor lighting in the studio, waiting for her to pick it up. I saw a little something in it I wanted to adjust, so she could not take it home when she first saw it. Right now I am trying my hand at some Rothko-style pieces. It looked like it would be really easy, but as with many things, appearances can be deceiving. I am finding it to be much more of a challenge than I anticipated. You can see examples of Rothko's paintings here. 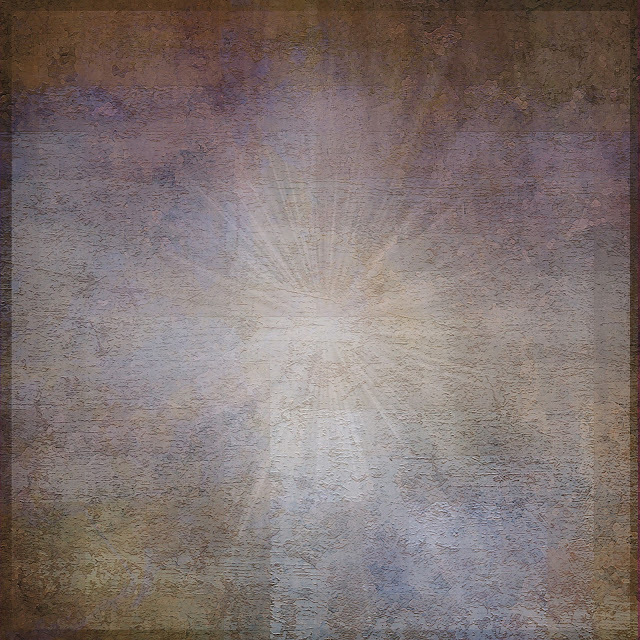 Here's a free texture for you. It does great things to skies, hence its name 'Sky Love'. The download button will be removed in a couple of weeks so download it while you can. BEautimous, Bonnie!! I love the peek inside your World and see lots of happy there!! Thanks, too, for the nifty texture. I have been enJOYing lots of giraffe fun and collaging giraffes and then digitally fiddling with them!! This break is good for me. I still come to the computer for my writing and daily digital fiddling, but I am reading a LOT more, drinking tea and staring out the window with Gracie BEside me on the chair and a half, listening to music, and generally soaking in each day's deliciousness. You paint nicely. I especially like the painting with two women. I paint too, but can not paint freely or abstract, but I try sometimes. You inspire. Thanks for the new texture -- missing our challenging photo Fridays but hey I understand -- and your work space - great lighting and what ever works that's what counts -- I could be very messing with that space - and not having to be concern if I spill on the floor - know matter how careful I am I always spill my paint on the floor..wink! 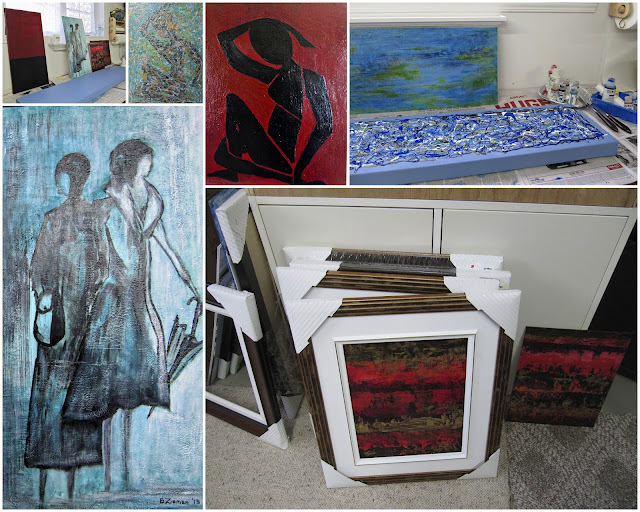 it's fun to see your paintings as well as the space that you use to create them. i'm happy that you are feeling freely creative. enjoy. enjoy. ENJOY. How fun, and what a privilege, to be allowed into your world, Bonnie! I loved seeing your studio and getting a sense of how and what you create. What a treat! Great to hear from you Bonnie. Your studio looks like a great place to work and the work you're doing is wonderful. I'm glad you're enjoying your break from the computer. Thanks for yet another wonderful texture! what a beautiful place, your studio! Wow...so talented. I love the one to your son and your daughter, amazing. Thanks so much for sharing a little part of your world with us and also for this fabulous texture. Enjoy your time creating, playing outside and photographing. I've thoroughly enjoyed my visit to your little piece of heaven. Your paintings are better than the originals! :-) I'm glad you are having a good break, we all need that. Blogging takes a LOT. Enjoy and thanks for the gorgeous texture! Oh, you are one talented lady Bonnie!! Thanks for a peek into your painting world. I have some blank canvases that have just been waiting for me for such a long time...I just need to step into the water! So good to hear from you! Wow- that is completely awe inspiring! I've wondered where you were- and yet am always hopeful when bloggers step away it truly is because they are simply "living life." So glad that is the case with you- living well, I might add. Enjoy! Thanks for the peek inside! Loved seeing your space, but more then that, loved seeing your other art. wonderful and exciting!! lots of great stuff aroudn where you work. I love the blue one for your son. It looks a bit like a couple of photos I took on water in a stream. A lot of ripples reflecting a yellow building and a red one. And some other stuff. :) I hope your son loves it. I love the last painting. It is very mystical and spiritual. Beautiful and calming work. amazing and brilliant art, I loved seeing your work!